How can you use Calin Basic Edition - Lawyer's Interest Calculator? Simply enter the principal amount, the start and end dates of the period, apply the rate and your calculation will be done. You can control when the interest is applied, when it is compounded, and what interest rate or interest rate schedule is applied. Not only calculate interest but produce text detailing how the result was obtained. This can be used in documents to verify the accuracy of the calculation and/or can be used to comply with court rules that require particulars of interest calculations. You don't have to remember when the rates changed or what the rates were. Store rates that change from time to time, such as court rates and finance rates, allowing you to automatically apply the correct date-dependant interest rate. You simply choose the rates from a convenient menu. You can update the files at anytime, or make new ones. For instance you can store all the Federal Court interest rates in a file. Whenever you have a Federal Court case, simply specify that file and the appropriate rate will be applied. Calculation schedules can be previewed on screen and also sent to word processing files, spreadsheets and the windows clipboard for pasting into other documents. Printed calculation schedules are well designed and ready to attach to reports, letters and court documents. They are produced instantly and with perfect accuracy, saving you time, stress, money & effort. Calculate repayment plans that take into account ongoing interest calculations. Calculate the amount and frequency of payments needed to reduce a debt to zero or other figure by a nominated date. Alternatively calculate how long a specified rate of payment will take to reduce a debt to zero or other amount. You can be pro-active with debt management for your business or clients. You can create repayment proposals based on flexible parameters and the debtors pay days. Complex calculations are performed effortlessly and with perfect accuracy. Avoid typing by printing repayment schedules ready for you to attach to letters and agreements. Scare debtors by showing them the effect of interest over time. Calculate and recover interest on your client and business agreements. Make money by recovering interest instead of waiving it because of the difficulty calculating interest. For instance, if your own contracts stipulate a term such as "interest at XYZ Bank prime lending rate + 2%" then calculations are complex because rates change frequently. Calin Basic Edition calculates it for you instantly, ready for your Accounts Department to recover. You don't have to work out for yourself the number of days between dates, or remember interest rates as at particular dates. No longer worry about making mistakes. You don't have to type details of the calculation or how you produced the result. All is done for you. Allow for interest accruals at particular intervals such as monthly. Calculate interest based on contractual terms. For instance, a contract formed on 14 July may stipulate that interest accrues on the 14th of each month. You can very easily set your interest calculation up so this is done. Allow for compound interest at particular intervals such as end of each calendar year. You can calculate compound interest based on contractual terms. You can easily set your interest calculation up so that interest is compounded at intervals set by you. 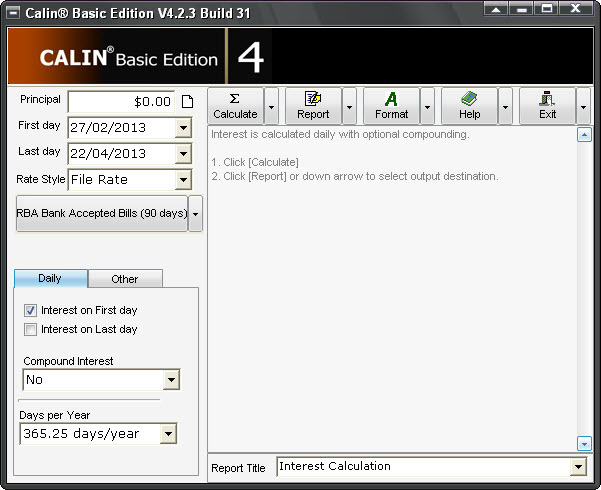 Calin Basic Edition is suitable for all English-speaking, decimal based currencies, eg AUD, CAD, Euro, HKD, NZD, PGK, USD. What can I do to find out more? Download a trial version of Calin today. Resources s Example: Interest Calculation Report (Text) Example: Interest Calculation Report (Tabular) Example: Interest Calculation Report (Repayment Plan) Calin Basic - User Manual Calculate days between two dates Calculate interest in Australian Court Jurisdictions.